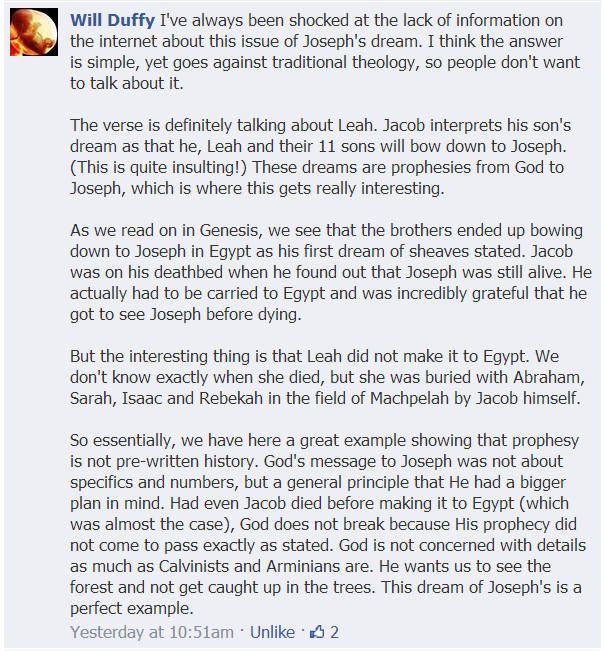 I’ve always been shocked at the lack of information on the internet about this issue of Joseph’s dream. I think the answer is simple, yet goes against traditional theology, so people don’t want to talk about it. The verse is definitely talking about Leah. Jacob interprets his son’s dream as that he, Leah and their 11 sons will bow down to Joseph. (This is quite insulting!) These dreams are prophesies from God to Joseph, which is where this gets really interesting. As we read on in Genesis, we see that the brothers ended up bowing down to Joseph in Egypt as his first dream of sheaves stated. Jacob was on his deathbed when he found out that Joseph was still alive. He actually had to be carried to Egypt and was incredibly grateful that he got to see Joseph before dying. But the interesting thing is that Leah did not make it to Egypt. We don’t know exactly when she died, but she was buried with Abraham, Sarah, Isaac and Rebekah in the field of Machpelah by Jacob himself. So essentially, we have here a great example showing that prophesy is not pre-written history. God’s message to Joseph was not about specifics and numbers, but a general principle that He had a bigger plan in mind. Had even Jacob died before making it to Egypt (which was almost the case), God does not break because His prophecy did not come to pass exactly as stated. God is not concerned with details as much as Calvinists and Arminians are. He wants us to see the forest and not get caught up in the trees. This dream of Joseph’s is a perfect example.